As I mentioned in my last post, I've been doing interviews for my book about J. Allen Hynek, and learning some surprising things in the process. A few days ago, I interviewed Mark Rodeghier, who started as a volunteer to Dr. Hynek back in 1974 and now is the President of Hynek's Center for UFO Research, or CUFOS, and, even though I've talked with him a dozen times, he had a few surprises for me. When it comes to UFOs, Mark knows just about everything, and what he doesn't know he can find out, because he's got every UFO expert in the word on speed-dial. And I like him because he recruited me to write this book in first place, and he recruited me because he read a few of my blog posts here on High Strangeness. And if that doesn't prove that anything is possible in this crazy, mixed-up world, I don't know what does. 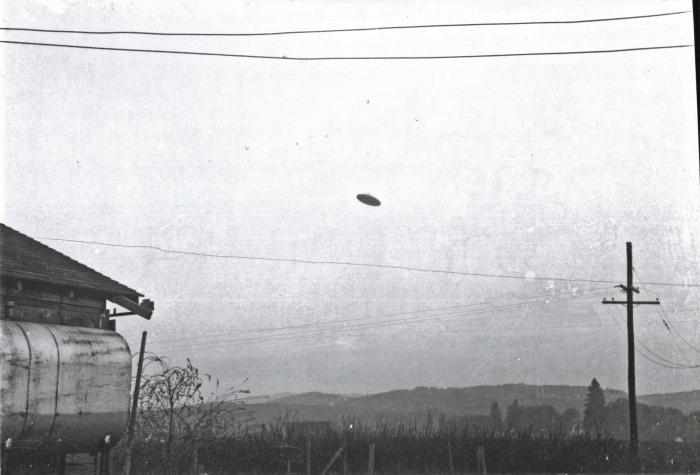 One of the most famous UFO pictures ever, taken in McMinnville, OR in 1960. Weird, or not weird? I say weird and a half. Anyway, during the interview, Mark and I had a long talk about his experiences with one of the greatest UFO researchers of all time. I asked him which UFO incidents were his favorites, and he gave quite a list of sightings that were of personal significance to him. But along the way he talked about how these incidents have changed their nature over the years and how that has changed the way they've been investigated over the years... And at one point he said, "After all, what is a UFO incident? It just means, 'Something weird happened here.'" I had to laugh! Here's one of the world's foremost experts on the UFO phenomenon -- if anyone had the right to take himself and the entire phenomenon entirely too seriously, it would be him -- and he boils the whole thing down to, "Something weird happened here." I love it! His take on it gives room for proper investigation. You can't classify something from the beginning as a definite incident. You aren't sure.